The gap between what customers want and what merchants offer is widening. It’s a challenge for growing retailers to carve out the time to keep up with rising expectations, research best practices and manage change. Sometimes, day-to-day demands keep you from planning effectively to build and optimize operations – eclipsing your plans for growth. Without realizing, your best intentions slip to tomorrow’s to-do list. Canada Post’s new e-book, Mastering your e-commerce operations, explains how to optimize every stage of your workflow so you can bridge the customer experience gap and position your business for growth. Download and dive in now, or read on for the top 5 tips to optimize your operations. E-commerce platforms: Choose from Shopify, Magento, WooCommerce and other platforms that are tailored to small and mid-sized business needs. By linking your online product and checkout pages with the back end of your online store, technology can help streamline and speed up your operational processes as well as reduce human error. Canada Post has integrated with leading e-commerce technology providers, and can guide you through the solutions that will best suit your chosen platform. There’s an app for that: Today’s off-the-shelf platforms offer more than a storefront. There are apps, plug-ins and integrations that can help you with marketing, analytics, support and more. Beware of trying to do it alone. Typically, upgrades will become unmanageable as your business grows, and you’ll need to start over. Shipping labels: What’s your budget, and how many labels do you need to print? You’ll need shipping software to create them and hardware to print them. A standard office printer (laser or ink jet) may be just fine. Depending on your stage of growth, or expansion plans, a thermal printer – which can handle bigger volumes, create bar codes and cost as little as $200 – could be your solution. Label technology is integrated into many leading e-commerce platforms and third-party shipping solutions.Take advantage of free online shipping tools when you can. Find everything you need to fine-tune your processes and close the customer experience gap. 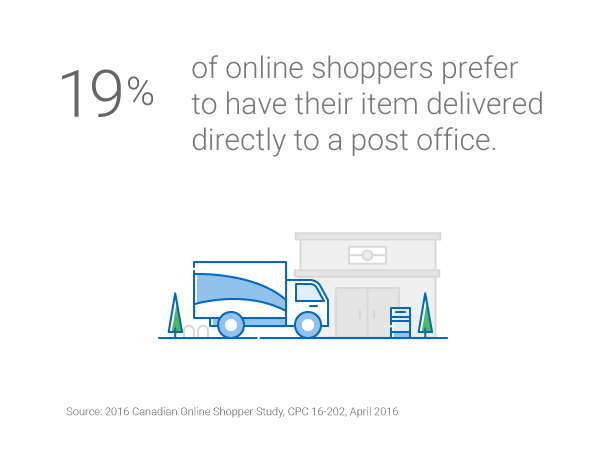 Seventy-seven per cent of Canadian online purchases are made by only 34 per cent of shoppers. 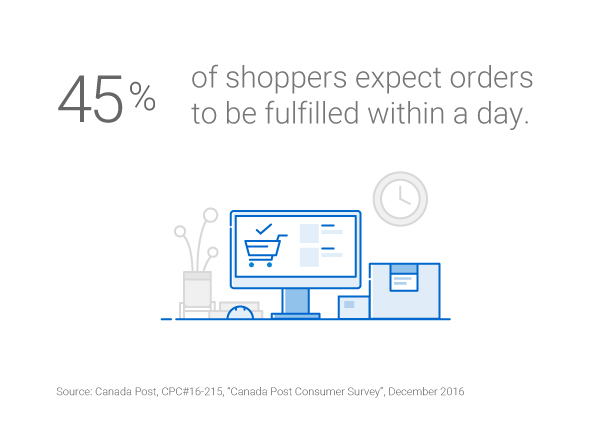 Known as power, hyper and hyper elite shoppers, they buy anywhere from 13 to 40+ purchases a year online. Mostly millennials and Gen Xers, these ultra-knowledgeable consumers do their research and consult everything from returns policies to free shipping and delivery speeds. They know what a best-in-class shopper experience looks like, and they’ll share it on social media. Design your fulfillment process with hyper shoppers in mind, and you’ll get it right for everyone. Savvy shoppers expect fast, and error-free fulfillment but, with many hands on this part of the process, it’s where errors can happen. Optimize fulfillment space, and make your packing process as efficient as possible to keep shoppers happy – and your business growing. Spend time choosing, organizing and resourcing your fulfillment space. Think about how to receive, place and store incoming inventory. Where will you put your packing stations? Do you have a space set aside for outgoing orders? Smart decisions lead to better execution as well as superior customer and employee experiences. Fulfillment is the beehive of your operation. Effective pick-and-pack processes are all about managing cost, minimizing errors and meeting customer expectations. Think about how you access inventory and optimize packaging for your product mix. Make sure you choose the right tools to process orders. Choose from basic, batch, wave and zone order-picking strategies. Provide tracking: With 96 per cent of shoppers tracking their items in transit, you can’t afford not to. Do this on your own site via integration with an e-commerce platform, or allow your shoppers to access your carrier’s tracking information. Be convenient: Know that 35 per cent of Canadians aren’t home during the day. They’ll likely need somewhere nearby for parcel pickup. Be speedy: Large retailers have raised shopper expectations, especially in larger cities and the Windsor-to-Quebec corridor. Offer multiple shipping speeds and services at checkout to cater to all needs. Be flexible: Give shoppers options. The big e-commerce players often provide a choice between home delivery, in-store pickup or collection from a post office using FlexDelivery™ (there are 6,200 across the country). Sometimes, it’s easier to pick up a parcel on route to or from work. As shopper expectations continue to rise, merchants must continue to invest and innovate. As behaviours change, it’s important to pay extra attention to your returns strategy. Nothing ruins shopping more than a bad returns experience. 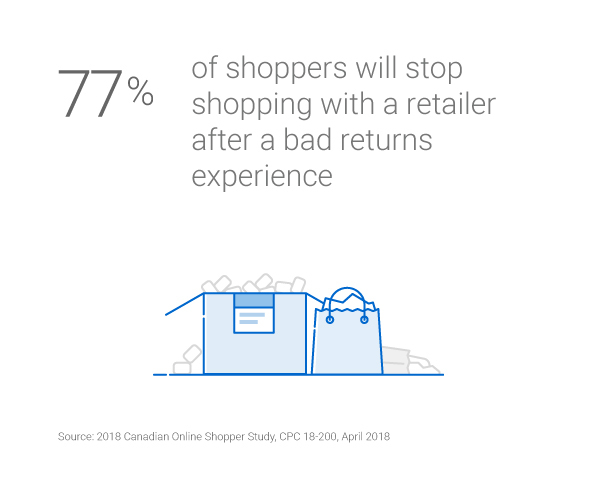 Unfortunately, where returns are concerned, the gap between what consumers want and merchants offer is wider than anywhere else along the e-commerce chain. Decide what truly anchors your returns policy. Is it the ease, simplicity and convenience customers demand, or the control and visibility that helps you manage the business? Your answer will shape your policy. If you’re happy to compromise, consider sharing the cost of returns with consumers. Mastering your e-commerce operations features three suggestions that have worked well for Canadian merchants. Choose your best market: Research potential markets for the best fit with both product and operational strengths. If you’ve already received online orders from shoppers abroad, start by analyzing your data to discover where they’re from and what they’re buying. Understand payment preferences: How do people in China like to pay compared with Europeans, for example? Do your shipping homework: What documentation is required to clear customs? Are there duties and taxes? How do you create shipping labels for destinations outside Canada? Consider the receiving experience: Does your delivery partner have relationships with carriers in other countries? Many merchants lean on the expertise of e-commerce and shipping partners who, from experience, understand market trends, shopper behaviours, customs regulations and international shipping strategies. To go deeper, read our Customs 101 blog. The better your back-end operations, the better your customer experience. Every stage of the workflow is critical – from taking an order to processing and delivering it. As you refine your workflow to better serve your customers, always be conscious of peaks in demand. Seasonal shoppers have a significant effect on operations – from your delivery promise to fulfillment space, packaging materials, shipping and returns. During the peaks, both volumes and expectations are high. Be prepared by getting ready for the holidays way before your shoppers do. Plan to increase fulfillment space, staffing and training. A well-executed strategy can minimize the negative effects of staffing churn. Consult your delivery partner for best practices and watch points. To up your order management game, take advantage of the best technology you can afford. And, if your delivery promise will change due to high volumes, tell your customers well in advance. Every improvement you make to your back-end operations has the potential to reward you with shopper loyalty. A finely tuned and responsive workflow enables you to give customers what they want. Design your operations – before, during and after purchase – with the hyper shopper in mind, and the rest will follow. You don’t have to go it alone. We share e-commerce research, practical tools and industry partners.